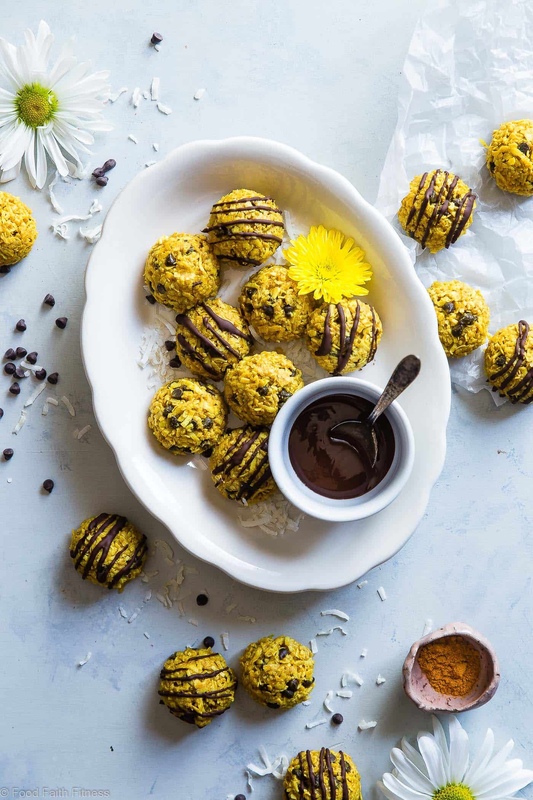 These super easy, healthy no bake cookies with turmeric, coconut oil and chocolate are perfect for a vegan, paleo and gluten free diet. I’m a huge turmeric advocate and use it every single day. So every time I see a new recipe, I tend to get pretty excited. These simple cookies by ‘Food Faith Fitness’ are just the thing to give you that sweet ‘sugar fix’ without any of the guilt! They also supply your body with wholesome superfoods and if you’re a believer, then they are anti-inflammatory and are packed with those all-important good-fats. 1 In a bowl, mix together the turmeric, coconut flakes and sea salt. 2 In a microwave-safe bowl, combine 2 tbsp of the almond butter, along with the coconut oil and microwave until smooth and melted. Whisk together. 3 Add the oil mixture, along with the honey onto the coconut flakes and mix well, (it will be quite moist). 4 Microwave the additional tbsp of almond butter until it begins to melt. It still needs to be thick and not liquid. Stir it into the coconut flakes, mix well and when the flakes begin to stick together, stir in the chocolate chips. 5 Scrape the sides of the bowl down so the mixture is all packed together at the bottom of the bowl and refrigerate for about 15 mins or until the coconut oil begins to firm. 6 Once firm, Using a cookie scoop place on a parchment paper lined tray. Refrigerate until firm. 7 Drizzle with additional melted chocolate.